Exclusively by Circle KB Inc. An original Bandolero pattern Brett originally built for himself nearly 15 years ago and it is the only shoulder holster we desire to deliver because of its adjustablity, useability and multi-functional characteristics. It was made to be readily accessible while riding, fishing or carrying a rifle. It had to be comfortable all day while riding horse back, secure and highly adjustable with easy access. Designed to fit with plenty of adjustment for different clothing or using conditions. The Circle KB Inc. Bandolero shoulder rig is styled with hand-laced, wet molded and dryed to fit cartridge loops for your rifle or shotgun loops (8)/ and 12 pistol loops. We can lace them all the same caliber providing you with 20 rounds for your revolver. Finished in a Natural oiled to color and tone is the most popular selection. Select from a plain, border tooled or fully hand tooled design. Payment Payment is made at the time you place your order online unless you have made previous payment arrangments. Orders go into the schedule in the order they are received. Payment in full is required before leather is cut. Call ahead if you need payment arrangements. Please allow 10-12 weeks from order date to delivery year round. 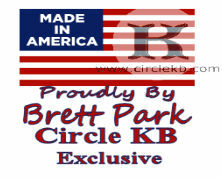 All Circle KB gunleather is custom handmade by fulltime Maker Brett Park. Brett works with multiple orders on his bench in different stages of progress. Orders go to his bench in the order they are received. Many orders have more than one gun belt, holster, rifle scabbard or matching knife scabbard with different tooling and finish otions which require more time. We appreciate being your Maker of choice and your patience as we aim to deliver the finest custom gunleather you will ever use and something that can be appreciated and passed on for generations.